Dr. Pratik Shah is a Principal Investigator and Principal Research Scientist at The MIT Media Lab. His research creates novel intersections between engineering, medical imaging, machine learning, and medicine to improve health and diagnose and cure diseases. Research topics : 1) medical imaging technologies using unorthodox artificial intelligence for early disease diagnoses; 2) novel ethical and explainable artificial intelligence based digital medicines and treatments; and 3) point-of-care medical technologies for real world data and evidence generation to improve public health. 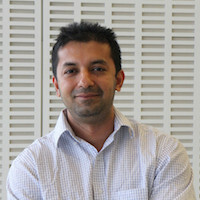 Dr. Shah’s graduate and postdoctoral research has contributed to the discovery of a vaccine component to prevent pneumococcal (Streptococcus pneumoniae) diseases; the identification of new pathways, technologies, and metabolites as antimicrobials to target gastrointestinal infections; and a non-profit organization to deploy a low-cost water quality test for the developing world. Past acknowledgments include the American Society for Microbiology’s Raymond W. Sarber National Award, a Harvard Medical School and Massachusetts General Hospitals ECOR Fund for Medical Discovery postdoctoral fellowship, coverage by leading national and international news media outlets. Dr. Shah has been an invited discussion leader at Gordon Research Seminars; a speaker at American Association for the Advancement of Sciences, Cold Spring Harbor Laboratories, Gordon Research Conferences, The National Academies of Sciences, Engineering and Medicine, TED and IEEE bioengineering conferences; and a peer reviewer for leading scientific publications and funding agencies. Pratik has BS, MS, and PhD degrees in biological sciences and completed fellowship training at Massachusetts General Hospital, the Broad Institute of MIT and Harvard, and Harvard Medical School. Read more about Dr. Shah's ongoing research at MIT here. Watch Dr. Shah's TED talk on biomarker prediction from low-cost images using machine learning here.